A Will is carried out through the probate process. 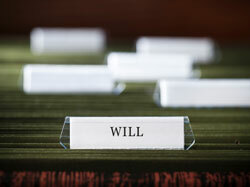 Most assets in your name alone at your death will be subject to your will (probate). Some exceptions include securities accounts and bank accounts that have designated beneficiaries, life insurance policies, IRAs and other tax-deferred retirement plans, and some annuities. Such assets would pass directly to the beneficiaries and would not be included in your will. In addition, certain co-owned assets would pass directly to the surviving co-owner regardless of any instructions in your will. And assets that have been transferred to a revocable living trust would be distributed through the trust—not the probate process administering your will. WisPACT Special Needs Trusts are created to help preserve the assets of people with disabilities without endangering their eligibility for public benefits or placement on waiting lists.